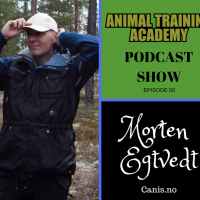 Norwegian dog trainer Morten Egtvedt and his wife Cecilie Køste have written three best-selling books about clicker training. They have also published the Nordic dog magazine “Canis” for exactly twenty years this winter. They are the owners of Canis Clickertraining Academy (the leading clicker training dog school in the Nordic countries). They have personally trained more 200 new clicker training instructors in Norway, Sweden, Denmark and Finland since 2003 through their now famous clicker instructor course. Morten has trained dogs mostly for high-level obedience and working dog competitions. He has also trained dogs for search and rescue and for military service for many years. He is a trained biologist with a degree in ethology, but he has always been much more interested in applied behavior analysis than ethology when it comes to practical dog training. Thank you, I have now heard this podcast several times and I am beginning to revise my training. Morten is right fluency is key. I am thinking when I do the free shaping that my dog tends to get a bit more frustrated. I know that frustration leads to change but I also want an easy win for my dog. Breaking down I guess is the answer to my own question thanks again! What a lovely way of training a dog….I enjoy watching the video’s!